» XMEGA A1U - Is it possible to create a PCB with an embedded debug USB? On the A1U eval board, there is a target USB and a debug USB. I was wondering if it was possible to keep this feature (the debug USB) when moving over to a pcb. I've read a bit into it, and it looks like it's just a few pins mapped to a USB port, but I am probably way off. I don't think you can buy the EDBG chip anyhow, but why would you want to do this? No: it is a second microcontroller - effectively, an Atmel-ICE built onto the PCB. Again, why would you want to include that in a final product?? USB debug can be very useful on production hardware. Techs in the field can get diagnostic data out, load diagnostic firmware etc. No need for a bootloader, firmware update can't really fail as you can always retry with a built in programmer. I've never seen that. If it were offered presumably people would be under-cutting Atmel-ICE sales right left and centre? USB debug can be very useful on production hardware. But I still don't see the point of putting, effectively, a full AtmelICE into the shipping product. people would be under-cutting Atmel-ICE sales right left and centre? (and a genuine ST-Link is only about twenty quid anyhow). Did Atmel really manage to secure their EDBG so much better than ST ? I thought that the EDBG chip was just an ordinary Atmel MCU, maybe a AT32UC3A4256. If that is the case then cloning it shouldn't be difficult. I was wondering if it was possible to keep this feature (the debug USB) when moving over to a pcb. USB can now connect directly to the XMEGA USB pins. 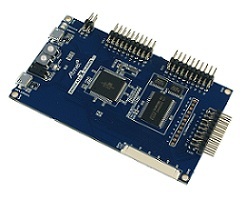 The XMEGA can be programmed over USB using the optional onboard AVRISP mkII compatible PDI programmer. Program over PDI is in the datasheet. Except that the code inside it is presumably "secure" (or at least as secure as the lockbits though I think there are some models of AVr32 that have a "vault" which is presumably something quite a lot more secure). The reason there are no clones is that Atmel don't document their debug protocols though a lot of it has been reverse engineered. But neither do ST - do they? I don't think that will stop anyone... Last time I looked they were doing simple things like placing a metal plate over the lock bits to prevent erasure with UV, which is easily circumvented by holding the UV light at an angle so it bounces under it.